Using transistor will be of some help, or just waste of money. Hey Onions have you gotten around to running the script yet? in several LED cubes (one of them is still in progress), and as signal lights in other projects. 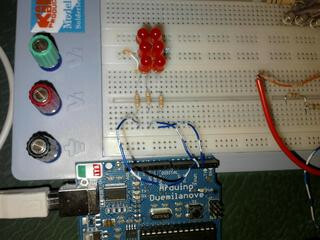 A 10X10X10 LED cube can be controlled by an arduino duemillanove / Uno! 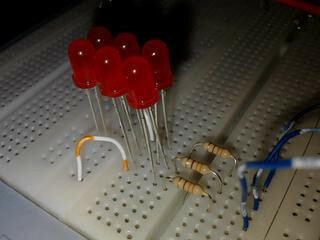 Using 11 pins, all charlieplexed into an grid, will give control 110 LEDs for the coloumbs. spare from the main ones and you can control all the layers too! I posted it so anyone else can try, should they want to! But my projects are so far limited to make a led flash, turn it on with a button, make two flash oh crap that didn't work, use two inputs to make two flash, make a row of 10 or so and light them in order, charlieplex some together and light them, LCD screen, charlieplex using 6 outputs..
completely un-random, or pre selected, but it seems quite the opposite. Although it looks bad in the video, it is due to the poor video quality of my camera. Wow that's pretty neat! I want to try that sometime. Maybe I'll use one of my spare 328's to build something cool. Also, I think that what you did is basically what the normal kind of random number generator does. As far as I know, they get a ton of truly random numbers and cycle through them (they might vary the length of the cycles, but you get the idea). Nice work! Just began dabbling in the whole Arduino world. Excellent way to keep my brain moving. Have been trying charlieplexing to do some basic LED stuff and was having problems driving 5 or more. Upon stumbling on your post and seeing your code it all became clear! Once again, build on!